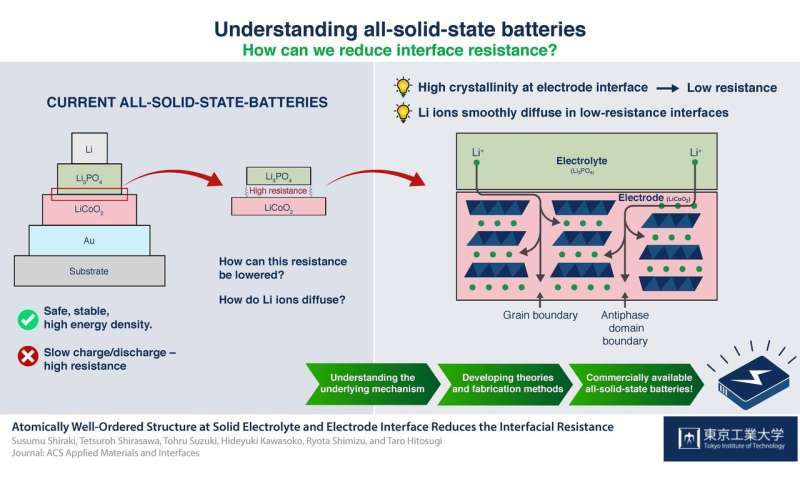 Scientists at the Tokyo Institute of Technology have examined the mechanisms behind the resistance at the electrode-electrolyte interface of the batteries entirely in the solid state. Their discoveries will help develop much better Li-ion batteries with very fast charge / discharge rates. Designing and upgrading lithium-ion (Li-ion) batteries is essential to pushing the boundaries of modern electronics and electric vehicles, as Li-ion batteries are virtually ubiquitous. 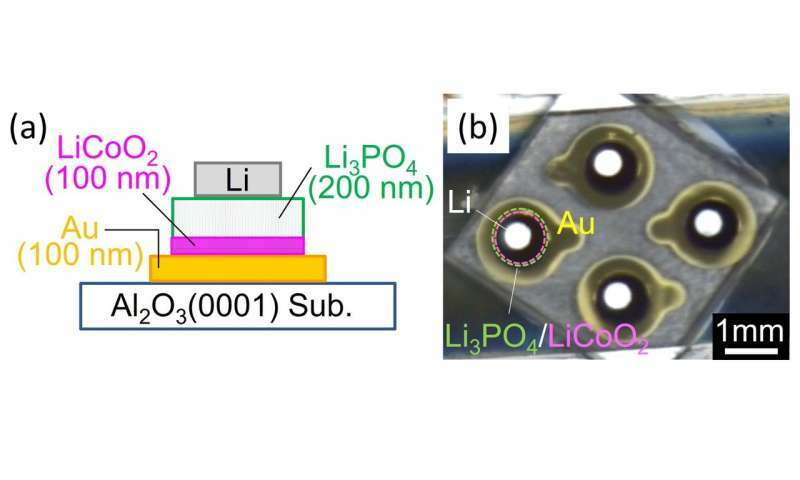 Scientists at the Tokyo Institute of Technology (Tokyo Tech), led by Professor Taro Hitosugi, had previously announced a new type of battery entirely in the solid state, also based on lithium ions. , which solved one of the major problems of these batteries: resistance to the interface between electrodes and electrolytes that limits the rapid charge / discharge. Although the devices produced were very promising and far superior to conventional Li-ion batteries in some respects, the mechanism behind the reduced resistance of the interface was not clear. It was difficult to analyze buried interfaces in fully solid state batteries without damaging their layers. 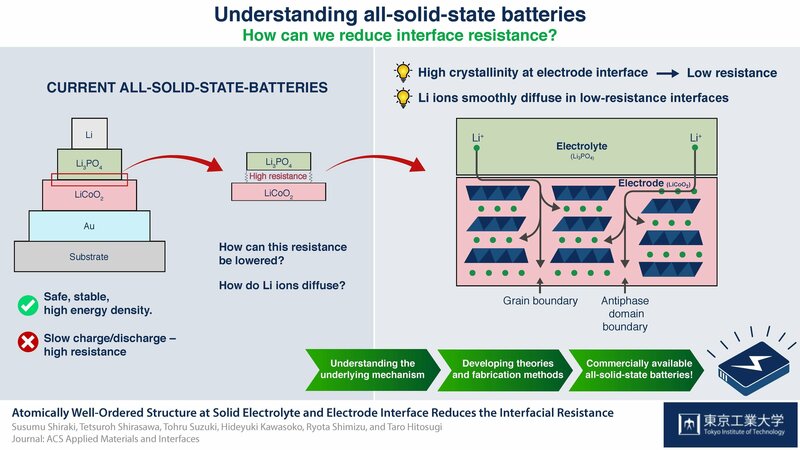 Hitosugi and his team of researchers have once again investigated the batteries entirely in the solid state in order to shed light on this subject. They suspected that the crystallinity (which indicates how well a solid is ordered and periodic) at the electrode-electrolyte interface played a key role in defining the resistance of the interface. To prove it, they made two different, fully solid batteries, composed of electrode and electrolyte layers using a pulsed laser deposition technique. One of these batteries probably had high crystallinity at the electrode-electrolyte interface, while the other did not. To confirm this, it was possible to use a new technique called diffusion analysis of X-ray crystal truncation. "X-rays can reach buried interfaces without destroying structures," says Hitosugi. 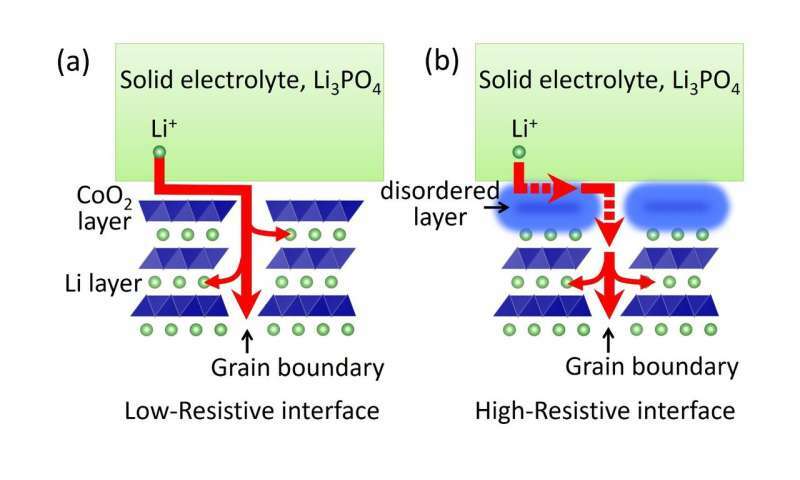 Based on their results, the team concluded that a highly crystalline electrode-electrolyte interface resulted in low interface resistance, producing a high-performance battery. By analyzing the microscopic structure of the interfaces of their batteries, they proposed a plausible explanation of the increased resistance of batteries with less crystalline interfaces. Lithium ions are blocked at less crystalline interfaces, which affects the conductivity of the ions. "Controlled fabrication of the electrolyte / electrode interface is crucial to achieve low interface resistance," says Hitosugi. The development of theories and simulations to better understand the migration of Li ions will be crucial to finally achieve useful and improved batteries for all types of devices based on electrochemistry.